If you are looking for dissertations and theses published in your area of research, there are lots of good quality, freely available online sources available to you. EThOS is a service from the British Library. It provides access to the full text of over 100,0100 theses wherever a copy exists that is freely available; either directly from the EThOS database or via a link to the repository of the awarding institution. EThOS contains 380,000 records relating to theses awarded by over 120 UK institutions. You will have to order items which are not freely available. If ordering via the Digitisation on Demand service, there may be a cost involved. DART-Europe E-Theses Portal provides access to over 590,000 open access research theses from 578 universities in 28 European countries. The theses listed are all open access and free of charge. The DART-Europe Portal doesn’t store theses, but it provides a link to at least one electronic copy of every thesis listed in its database. As a minimum each thesis contains details of the author, title and date of award. However, many providers supply additional searchable information, such as abstracts and keywords. 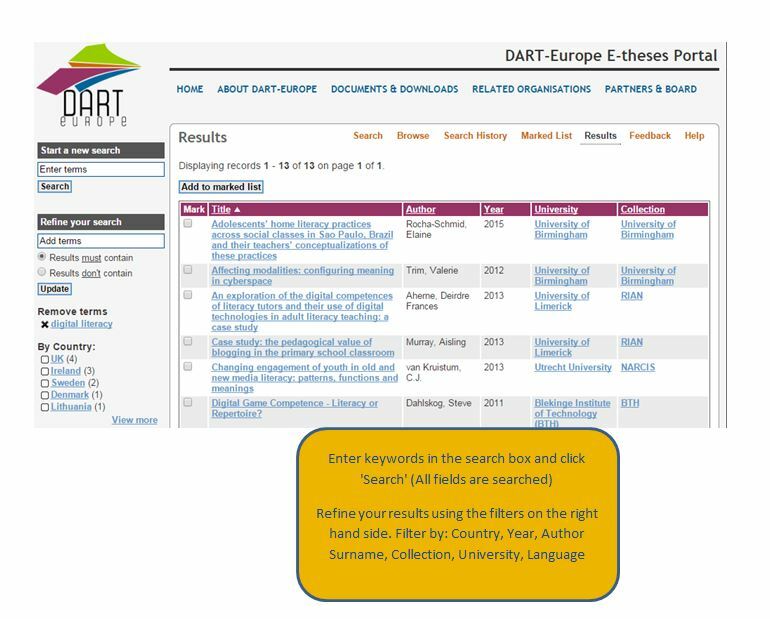 The Browse feature allows you to browse records harvested by DART-Europe by author, year of award, collection, awarding institution (where known) or country. Select an index to browse and follow the links to the theses which interest you. Results are shown by default in a brief summary format. 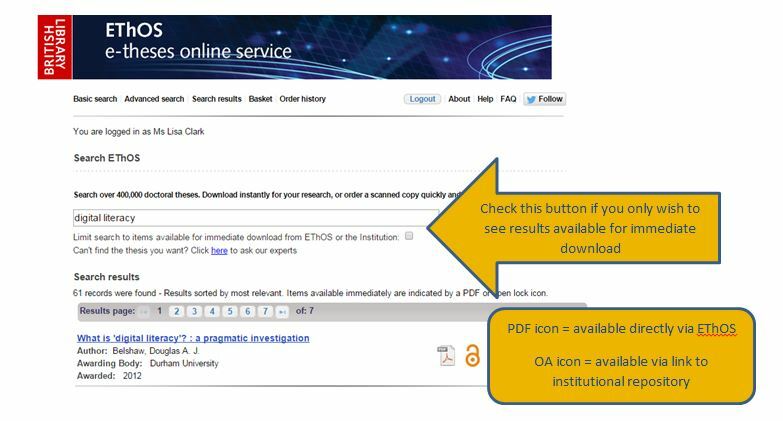 To view the full record for any thesis, and to access a copy of the thesis, click on the title. PQDT Open provides the full text of open access dissertations and theses free of charge. The authors of these works have opted to publish as open access and make their research available for free on the open web. Enter keywords or use quotation marks to search for an exact phrase e.g. “Digital Literacy”. If you select ‘More Search Options’ you can also search using ‘Keywords (dissertation topic)’ to find dissertations and theses focused on a particular area, as described by the author. An Open Access Initiative union catalogue of theses and dissertations from many countries, which are all immediately available electronically via links to institutional repositories. An index of over 1.6 million freely available electronic theses and dissertations. SUDOC is a French union catalogue which allows you to search theses and dissertations completed at universities in France. Dialnet allows you to search for theses completed at Spanish universities – many have links to the full text. The University’s digital repository of research output allows you to search or browse the different collections. If you are interested in depositing your research in ARC, please email repository@abertay.ac.uk for more information.